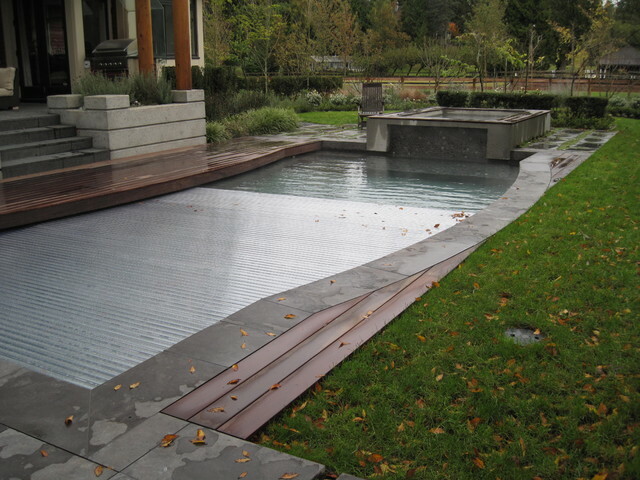 Alka Pool Construction of Vancouver BC Canada installed our HydraLux pool cover with Clear Polycarbonate slats. The HydraLux is our automatic swimming pool cover that offers the best insulating quality of any automatic pool cover. This pool and cover installation is an award winner at the 2013 Canadian Pool & Spa Design Council. It is a Model #1, standard the pool mount and is manufacturer by Aquamatic Cover Systems of Gilroy, CA. Existing Freeform Pool - Can this cover be installed in an existing Freeform pool? Can you give me pricing information? - I've read that retractable covers run 10-20k. Is this an accurate range? 8. Cover up. Pool covers can be a pool owner’s best friend. Not only does a cover retain a heated pool’s temperature, but it reduces evaporation. The Department of Energy reports that a pool cover cuts the amount of replacement water needed by 30 to 50 percent. I probably don't want to know how much this costs, but it would solve our fence problem. Gib - San Pools Ltd.